Throwing shade at TLC-based SSDs. 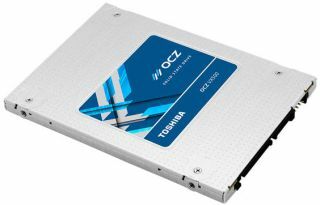 Toshiba has a new mainstream 2.5-inch SATA 6Gbps solid state drive line under its acquired OCZ arm, the VX500 series, intended for users looking to finally ditch their comparatively pokey hard drive as the primary storage option. Though these are affordable SSDs, you won't find any triple-level cell (TLC) NAND flash memory underneath the hood. Toshiba makes crystal clear that these drives use its own multi-level cell (MLC) NAND flash, noting that penny-pinching users don't need to sacrifice endurance for a lower cost SSD. "Delivering over 3X the endurance of TLC-based SSDs, the Toshiba OCZ VX500 SSD series ensures users who need increased product longevity aren’t neglected in the wake of a value-oriented market," said Alex Mei, VP of Marketing and GM of Etail/Retail SSDs at Toshiba America Electronic Components, Inc. "The VX500 series was designed for today’s DIYers looking to upgrade from traditional hard drives with a solid state solution that thrives in the wide spectrum of mainstream oriented mixed workload applications." We haven't had the opportunity to test these new SSDs yet, but going by Toshiba's specs, they offer sequential read and write performance of up to 550MB/s and 515MB/s, respectively. Toshiba says these drives thrive in mixed workload scenarios, so there shouldn't be a big drop off in performance if you're moving big or small files. It also touts endurance ratings of 74TB (128GB model), 148TB (256GB model), 296TB (512GB model), and 592TB (1TB model). The drives are backed by a 5-year warranty and come bundled with Acronis True Image cloning software.